Why not get Russia and Iran involved in a cease-fire and UN plan instead? Not coincidentally, the White House plans to scare members of Congress into supporting the ill-conceived war plan by waving the Iranian flag in their faces. Even liberal Democrats, some of whom are opposing or questioning war with Syria, blanch at the prospect of opposing Obama and the Israel lobby over Iran. At first glance, the festering Syria crisis seems bad news for diplomatic efforts to keep Iran from developing nuclear capabilities. In actuality, however, achieving U.S. objectives in the Syria crisis is an opportunity to pressure Iran into making hard choices not only in Syria, but regarding its nuclear program as well. More U.S. involvement to achieve its objectives in Syria will inevitably run counter to Tehran’s interests, be it to punish the Assad regime for chemical weapons use or to show support for the Syrian opposition in changing Assad’s calculus and forcing him to “step aside” at the negotiating table or on the battlefield. Like every alliance, its members will only make hard policy choices if the costs of its current policies far outweigh the benefits. U.S. strikes on the Assad regime, if properly calibrated as part of an overall plan to degrade the regime, would force Tehran to become more involved in Syria in order to rescue its stalwart ally. This would be costly for Iran financially, militarily and politically. Those costs would make the Iranian regime and its people reassess aspirations to go nuclear. Needless to say, such a strategy is bound to be counterproductive, since—by slamming Syria, never mind toppling Assad—Washington is likely to undermine doves and bolster hawks in Tehran and undermine the chances for successful negotiations with Iran’s new president, Hassan Rouhani, who’ll be speaking at the UN General Assembly later this month. Prime Minister Benjamin Netanyahu of Israel would prefer that Obama enforce his red line on chemical weapons use, because he would like to see proof that Obama believes in the red lines he draws. 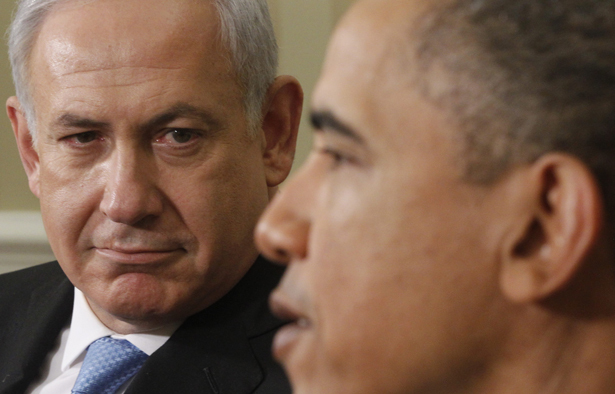 From Netanyahu’s perspective, Israel isn’t unduly threatened by Assad. Syria constitutes a dangerous, but ultimately manageable, threat.